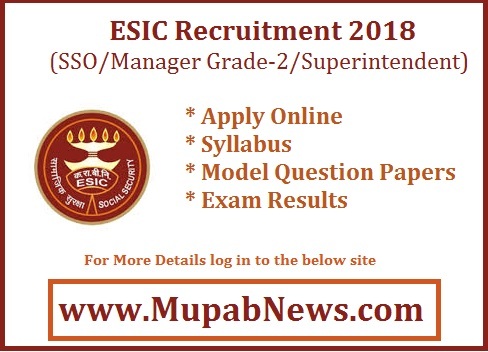 ESIC SSO Recruitment 2018 Notification : ESIC released a Notification for the 536 Post of SSO(Social Security Officer)/Manager Grade-II/ Superintendent Recruitment for the Annual Year 2018-2019. ESIC (The Employee’s State Insurance Corporation Limited) SSO apply online at official site www.esic.nic.in or www.mupabnews.com. In this page, we are providing the ESIC SSO pay scale salary, Syllabus, Exam Pattern, Recruitment Rules, Age Limit, Important Dates(Opening and Last date to apply & Exam date), Educational Qualification, Detail of Vacancies, and also we will Notify once the ESIC SSO Result 2018 Declared. Stay Tuned will Mupabnews team through Facebook and other social media. Category E - Multiple disabilities from amongst persons under clauses (a) to (d) including deaf –blindness. Note 1: The candidates appointed under PWD and Ex-Servicemen quota will be adjusted against the vacancy of respective categories of SC/ST/OBC/Unreserved (UR). Note 2: Ex-Servicemen who have already secured employment in civil side under Government in Group ‘C’ & ‘D’ posts on regular basis after availing of the benefits of reservation given to ex-servicemen for their reemployment are not eligible for reservation for appointment under EXS categories. However, they are eligible for age relaxation only. Note 3: Vacancies notified above are subject to change. What is the Salary(Pay Scale) for ESIC SSO Recruitment 2018 ? Note: In addition to Pay they will also be eligible for DA, HRA and Transport Allowance and other allowances as per rules in force from time to time. Working knowledge of computer including use of office suites and database Experience (Desirable): Three years’ service in a Government Organization or Corporation or Government Undertaking or Local Body or Scheduled Bank etc. What is the Application Fee for the post of SSO/MG-2/Superintendent ?? What is the ESIC Recruitment 2018 Application Opening and Late date to Apply Online? ?